I don't think I knew these awards were a thing, or if I did, I didn't realise they had a book blog category. I certainly didn't expect to be shortlisted - and hey, I doubt I'll win, but it would mean more than you know if you could vote for me! Click here to go to the voting page. You'll have to put in your email address and vote in every category (mine is towards the bottom) and don't forget to click 'submit'. Thank you!! I've always been a perfectionist. I rarely coloured outside the lines, I've given up on a few potential hobbies because I wasn't immediately 'good enough', and I've been known to give up on filming a YouTube video because my hair wasn't how I wanted it to be. I keep to 99% of deadlines I receive, I always have blog posts scheduled, and I hated booking my theory and practical tests because I didn't think I was at a high enough driving standard to pass, even though I was. (Might've had some issues since then, though... the story's in this video. Brb, dying of embarrassment.) I did triple the amount of work I was asked to do for my Media Studies coursework this year and last year, and I'm never late to anything. Ever. It can be kind of stressful, but lately I've noticed that I'm stressing less and less about the small things. (I'm not some wondrous relaxed goddess - I am generally quite a stressed person, most of the time. I'm just talking about the small stuff.) I don't know why - maybe I'm in a good patch, anxiety-wise? (Is that even where my perfectionism comes from? Who knows. #Deep.) Or maybe I'm tired from revising all the time, and therefore lazy. Whatever the reason, I kind of like it. And the more I notice it, the more I realise that some forms of perfectionism are stupid. For example, whenever I used to screw up my eyeliner, I'd wipe it off and do it again. And again. And again. I didn't like doing it, especially if I happened to be in a rush, but I also didn't want to look like a raccoon with poor motor skills, y'know? And if I parked badly, I'd spend ages correcting myself. I hate parking, not helped by the fact that that's how the incident happened that I mentioned earlier. It's... yeah. MOVING ON. Now I'll happily leave the house with slightly asymmetrical winged eyeliner, and if I park badly, I just leave it (as long as it's in the lines, obviously - I'm not that person who ends up with several notes on their windscreen telling them they're a prat. I'm not at that level of bad parking, I'll have you know.) What a rebel, right? I've even requested a couple of late hand-ins for homework this year, whereas before I would have stayed up until the early hours of the morning, trying to finish an essay whilst bleary eyed and sleep deprived; not the most efficient way of working, I'm sure you'll agree. 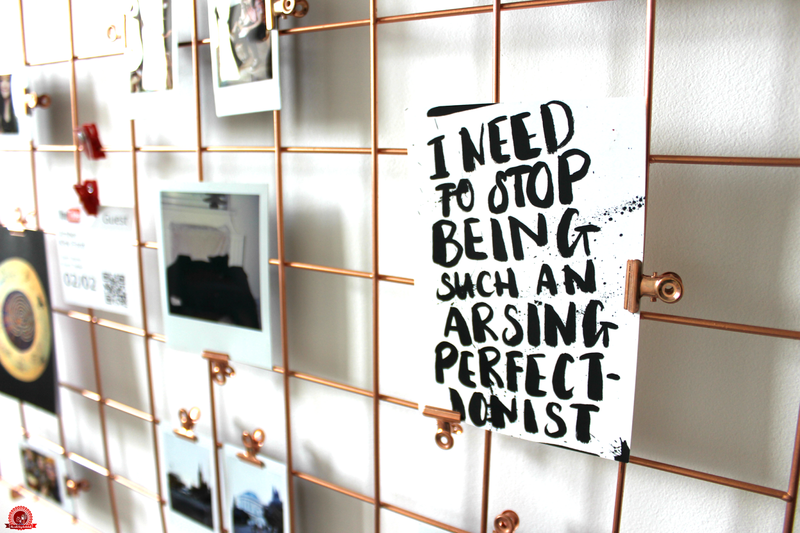 I'm still a perfectionist in a lot of ways; I've subconsciously kept the perfectionist aspects I appreciate, like the perfectionist in me that gets me good grades, and on time to places I need to be, and the perfectionist in me that keeps my room pretty. But the meaningless things, the things you might complain about only to be told life's too short, are on their way out. Because, really - who EVER looks that closely at anyone else's eyeliner unless they've uploaded a photo of it because they did a good job? And when I park badly, but within the lines, AM I GOING TO DIE? The answer to that is no. Might get judged a bit, but it's not the end of the world. The moral of this blog post is that life's too short to sweat the small stuff. Do extra work if you want to, get to places on time, and keep your house tidy; they're pretty good habits to have. But if you're not immediately good at something... who is? If your makeup isn't at a Kardashian level... who's going to care? If you have a reading schedule and you haven't kept to it... is anyone going to die? Are you officially the person responsible for ending the world? Is everything on fire? As punishment for not handing in your homework on time, have you magically but unfortunately swapped bodies with Nigel Farage? Lots of perfectionists want to stop being perfectionists, but like most things, it has its bad points and its good points; the key is to chill out and gradually work on the bad ones, whilst keeping the good. So, yeah, some thoughts. It sounds obvious, and maybe most people have that figured out already, but hey - here's me chilling out and lessening the perfectionism by posting it anyway, obvious old news or not. Are you a perfectionist? What do you love and hate about it?